I know, not the most fun topic to cover. But since our kids are getting older and my husband is an attorney assigned to the victims of sexual assault/abuse, we have really gotten more serious about how to protect our kids against this very common occurrence. So I’m sharing specifics about sexual abuse, common signs of offenders, kids who are at risk, and the boundaries we have in place to help protect our kids. Just because you don’t talk about this issue doesn’t mean your family is not at risk. In fact, it probably means you are more at risk if you are not considering the possibilities and creating plans to help mitigate risky situations. Let me know what you think and what your rules are. Bioclarity is my new favorite skincare regime. 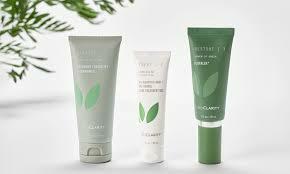 With a three-step process that hydrates and restores my skin, I am absolutely loving this system. This would make another great gift for yourself or someone you love! You can get your first month for just $9.95 when you go to www.bioclarity.com and enter code EMP.